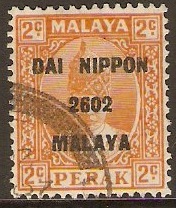 Perak 1942 2c Orange. SGJ191. Used 1942 2c Orange. SGJ191. 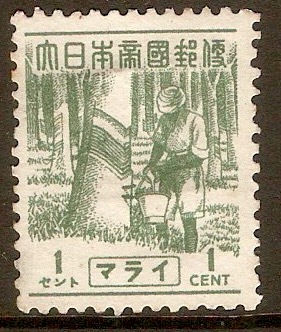 Japanese Occupation Stamp. Perak 1942 3c Green. SGJ192. 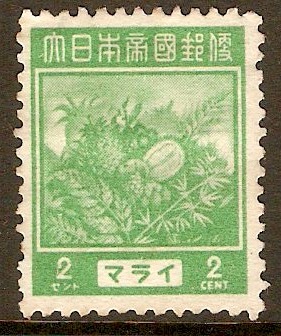 Used 1942 3c Green. SGJ192. 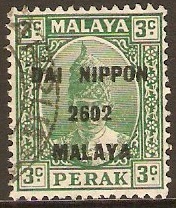 Japanese Occupation Stamp. 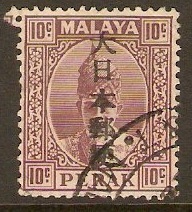 Perak 1942 10c Dull purple. SGJ196. Fine used 1942 10c Dull purple. SGJ196. 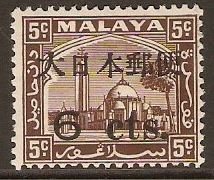 Selangor 1942 6c on 5c Brown. SGJ293. Mounted mint 1942 6c on 5c Brown. SGJ293. Japanese Occupation 1943 1c Grey-green. SGJ297. 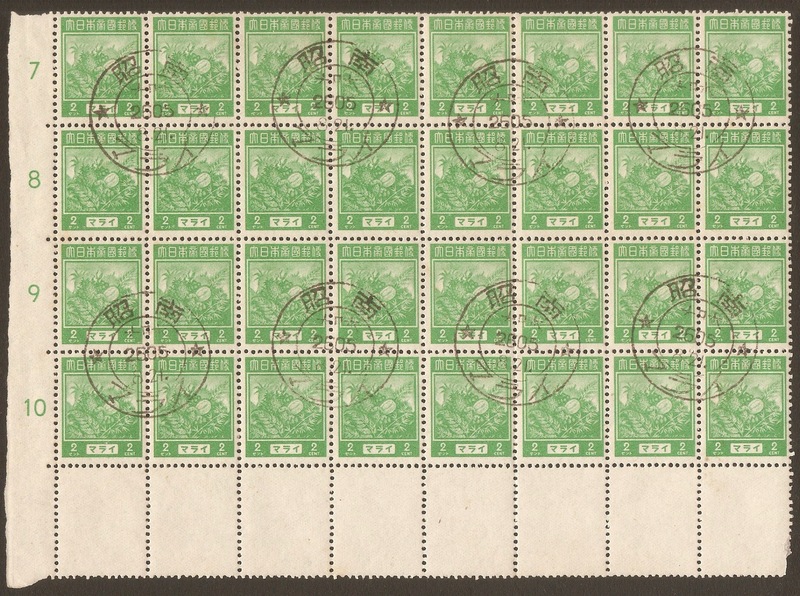 Unused Japanese Occupation 1943 1c Grey-green. SGJ297. No gum. 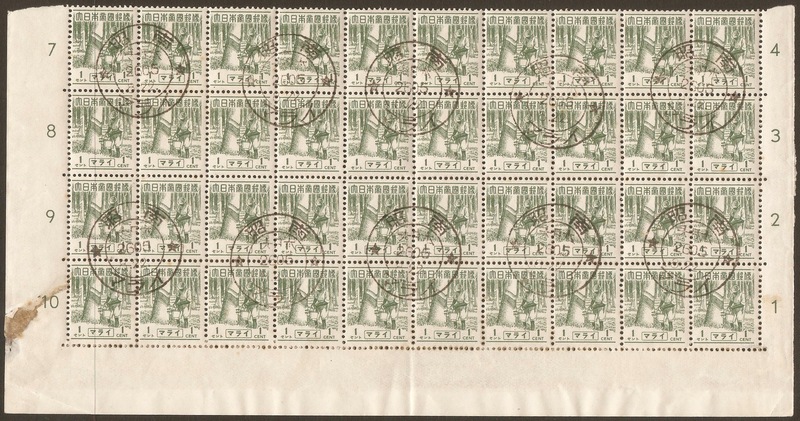 Fine used 1943 1c Grey-green. SGJ297. Block of 40. NOTE: Stain in l/h margin. Japanese Occupation 1943 2c Pale emerald. SGJ298. Unused 1943 2c Pale emerald. SGJ298. No gum. Fine used 1943 2c Pale emerald. SGJ298. Block of 32. 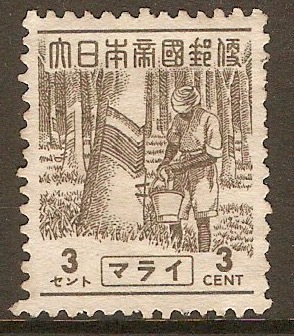 Japanese Occupation 1943 3c Drab. SGJ299. 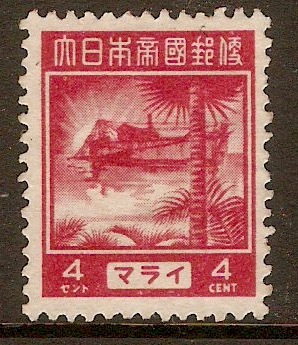 Unused Japanese Occupation 1943 3c Drab. SGJ299. No gum. Japanese Occupation 1943 4c Carmine-rose. SGJ300. Unused 1943 4c Carmine-rose. SGJ300. No gum.